St. Luke's Episcopal Church - Times Publishing Newspapers, Inc. Established in 1832, St. Luke’s is rich with history, evident when one visits its quaint and beautiful church. The colonial-style box pews installed during the renovation in 1995 are patterned on the original pews. Over the altar is a copy of the 1485 Italian Renaissance sculpture, The Coronation of the Virgin, originally created by Andrea Della Robbia. This magnificent sculpture shows the Blessed Virgin Mary being crowned as Queen of Heaven. Although surrounded by history, the congregation of St. Luke’s Parish is a vital and growing family in Christ. St. Luke’s offers many programs for its parishioners and visitors some of which include: Sunday School, Adult and Youth Choirs, Choir Camp, Vacation Bible School, Prayer Shawl Ministry, and the Christmas Charity Bazaar which donates all proceeds to area charities. St. Luke’s also offers a Food Pantry to local families in need. Come visit us for a Sunday service at 8:00am (no music) or 10:00am (Choir and Traditional Hymns). We also have a Healing Mass at 10:00am on Wednesdays, and on Saturday mornings, there is Rosary at 8:00am, Morning Prayer at 8:30am, and Holy Eucharist at 9:00am. On the fourth Saturday of the month St. Luke’s offers a Jazz Mass at 5:00pm. Whether you sing or knit, would like to usher or teach, or simply want to celebrate the Eucharist in the company of caring people, St. Luke’s welcomes you. 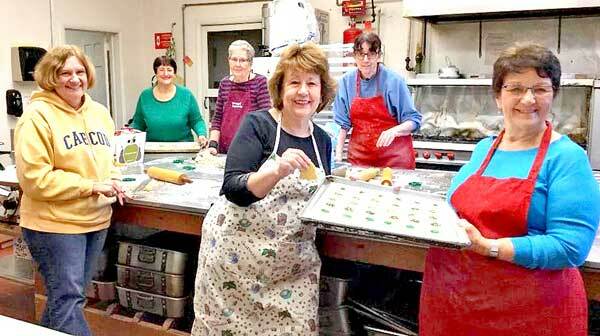 PHOTO CAP: From left, Robin Connell, Kathy McGeary, Barbara Stevens, Lorraine Bell, Mary Blane, and Ruth Mooney prepared cookies for the Christmas Charity Bazaar at St. Luke’s Episcopal Church.